Size : 2324 Sq.Ft. to 2582 Sq.Ft. 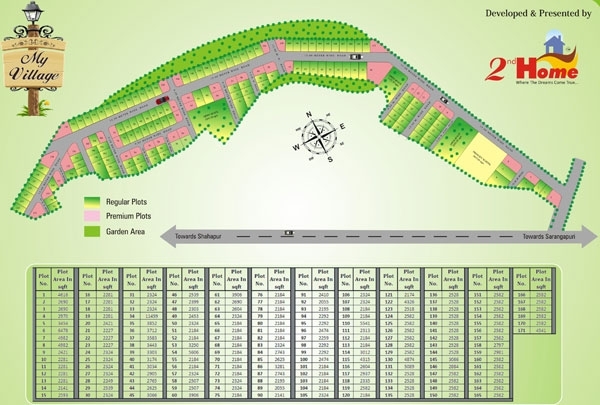 My Village is a Plot project carefully and aesthetically designed and developed by 2nd Home Developers. It is situated at a very serene and nature friendly location in Sarangpuri Shahapur, Thane, Maharashtra. My Village at Shahapur is situated at one of the greenest patches in Thane District with scenic views and a land blessed with nature's beauty perfect for a Weekend Bungalow or Villa Homes. 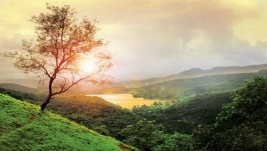 It takes only 50 minutes from Thane to reach this beautiful weekend destination where you can plan out to live with peace and harmony away from the noisy and hustle cities. My Village is developed on over 18 acres of land and has close proximity from National Highway 3. As per the daily increasing needs of Second Homes keeping in mind a fantastic Development Team was formed known as '2nd Home Developers'. 2nd Home was built with trust, quality, honesty and to fulfill the requirement of Second Homes in a better way. 2nd Home Developers has achieved a good name in the real estate market by proving classy Second Homes in India. My Village represents a fantastic project by 2nd Home Developers. Every aspect of Investment in Second Homes has been covered by 2nd Home Developers to invest your money at the right place with fruitfull gains. 2nd Home offers you a great real estate investment platform with the value for money properties. *Note: Prices, Sizes and Payment modes are indicative. Please avail the latest updates via Phone or Mail on the above given contact info. From Thane it is just 65.6 kms via NH3 which takes about 1hr 11mins Drive. From Mumbai is 85.9 kms away and takes 1hr 37mins Drive. From Karjat it is at a distance of 85.5 kms and takes 2hrs 16mins drive. From Nashik it is at a distance of 92.3 kms and takes 1hr 39mins drive. 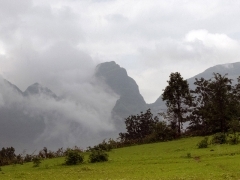 Igatpuri is at a distance of 46.3 kms and takes only 1hr 1min drive. Rate Per Sq.ft. Rs. 275/- per sq.ft. *Note: The given figures are indicative. Please avail the latest updates by calling us on 09833670220 or just fill up the above given form and you will get a call from us shortly.